California Permanent Plate: There are over a dozen regularly issued standard and personalized plates made of metal, which should have valid, unexpired stickers in the corners of the rear plates. Front plates are mandatory and not an option. California Temporary Plate: Installed by new and used car dealers at the time of sale, these are numbered paper plates which identify the vehicle made, VIN number and temporary license number. These should remain on the vehicle until the permanent plates are received from the DMV. 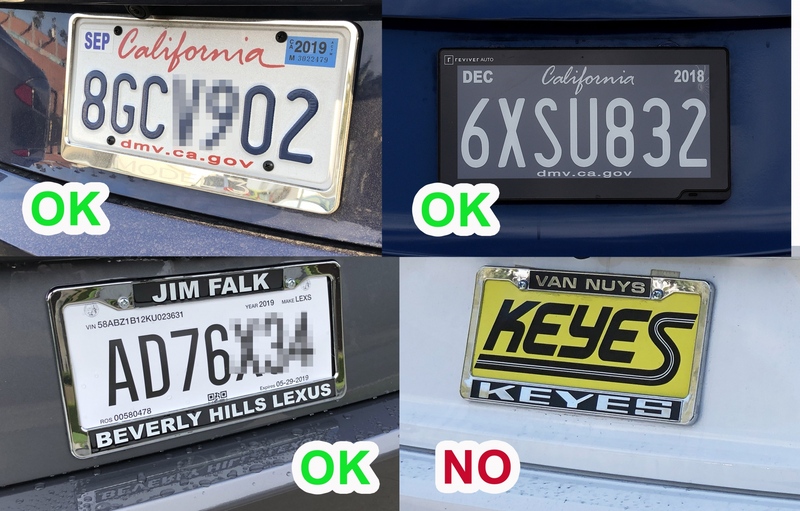 California Digital Plate: The State is issuing on a test basis (and high cost) digital license plates which have various new features in addition to the identification numbers. They may look fake, but they're legit. For more information from the official DMW site, please click here.